Mens Designer Wallet Custom Shark Crocodile Wallet. 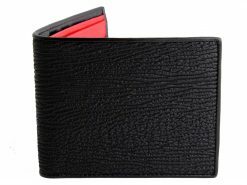 Get your hands on this awesome mens designer wallet made from sharkskin featuring genuine crocodile running through the center. One of our all time personal favorites, these fly out the door. We’ve made a match in heaven with this combo, black shark leather bordering a central band of seriously cool crocodile skin. 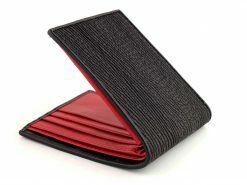 Finished with a wicked red calfskin interior, these are an exotic croc wallet that will make others sit up and notice. If you want a wallet that starts a conversation then you need one of these. Exclusive to RMW, this signature series wallet is a one of a kind. Super fast shipping & great craftsmanship very happy with my new wallet!